child be before being unsupervised in the bath tube? My child is very independent. He is almost 6 years old and for 2 years now he keeps asking me to give him privacy while taking a bath. I think he is to young to be unsupervised. What do you think? I would say 6 is old enough. If you are concerned start by just going out for a minute but call out to him while you are gone. I used to call out silly things just so I would get a response and I would know all is well. This is a first step of many in giving them some independence. Wait until they want to stay at home when you go shopping....now that is scary. I would agree with you that he is too young to be left alone.One thing you can try though if he keeps saying he wants privacy is to sit in the Hall outside the bathroom, sort of fool him into thinking he is by himself.It's hard when they start to want more independance because they don't really know that it's not safe and accidents happen. I would say he would be alright to be in the tub alone , you can always still go peek in on him if you are still nervous about him being in there alone , but at 6 he should be capable of taking a bath on his own . Once they hit school age they are much more dependent and want to start doing things on there own and things like this that they ask are just a part of them growing up and letting you that they are able to start doing things on there own . At 5 or 6 I let mine bath alone - or at least they thought they were, door open and I would busy myself right outside the bathroom where I could "peek" in on them the whole time. I think by 7 I was letting all of them have their total privacy. Even though I know he is responsible I still have a fear of him hitting his head and drowning, even though we don't fill the bath tube up much. I keep hearing of these kids drowning in an inch of water with their parents right in the next room. I do pray a hedge of protection around him daily and so does my family, but that fear is still their. Am I trusting in God? You can give him some privacy without leaving him isolated. Just sit outside the bathroom on a chair and read a book or the newspaper. Tell him you are leaving the door open just in case he needs help and that you won't be far away. That way you will be able to hear any extra big splash, or if it gets too quiet, you can tiptoe past and check on him. I think your child is right. 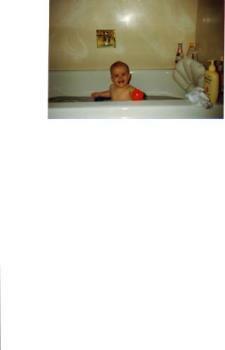 You would have to be mentally retarded to drown in a bath at 5 years of age. Teach him to swim if you are worried. The fact is... he is about to enter primary school... and he is going to need to deal with a lot worse than taking a bath. He is taking his first steps towards adulthood. If you protect him from everything... later on... he won't be able to cope with life. When you protect your child... you teach him to be fearful of things. Which is the worse thing you can do. Fear paralyze people and prevent them doing things. Once it is in them... it never comes out and it wrecks their adult life. Thanks you everyone for your advice. It has really helped. make sure there is nothing that could cause him harm and let him grow up. Tell him you will check if he has washed properly and if he hasn't he will lose his priviledge. My youngest grandchild is three and she baths herself, she just won't take a shower because she is afraid of the water. Her mom will only go in when she needs to have her hair washed because she has very long hair and cannot wash it properly. I think your child is very ready to be having bath time by himself. At that age they are pretty self-concience. My children are 5 and 2 1/2 years. They both take baths by themselves - we periodically check on them though. Even if it's just as much as saying - what are you doing? Or how are you doing? They know that they have to answer me or I will come bursting in the bathroom. Go ahead - give your child a bit of privacy. It depends on the maturity of your child and they act when you are in the room. If they act careless then no it is not time. My son was always very careful and cautious and did not goof around, so I allowed it at about 5, but I was very close by and I left the door open in case he got soap in his eyes or started playing too rough.